Grandiose mountains, rolling plains covered with fields of wheat and barley, the romantic mystique of the West—these images are what people envision when thinking of Montana. Few people immediately think of the hardship of winter, isolation, or cold variables understood only through the lens of uncommon insularity. But those who know the history of Montana know both the good and bad are part of its sprawling heritage. Montana’s disposition has been twice represented on the big screen (Slaughter Rule, Winter in the Blood) by Big Sky-born filmmakers Alex and Andrew Smith, who are currently in pre-production of their third film Walking Out, the story of a father and son reunited on an annual hunting trip, and about life and death. 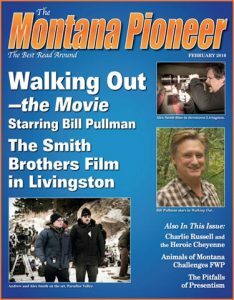 Filmed on location recently in Paradise Valley, Livingston and Bozeman, and written by David Quammen 41 years ago in Missoula (when he worked there as a bartender), Walking Out earns its Made-in-Montana label. Indeed, Montana’s Smith brothers revere their art as the sharing of visual and emotional truth—the landscape, topography and scenery of our state being sacrosanct intermediaries deservingly depicted in celluloid. Practically every sort of terrain is available in Montana with the exception of coastal and arid desert. Visually diverse, the fourth largest state has vast forests, peaks jutting to 12,000 feet, grasslands, panoramic views, irrigated farmland, badlands, alpine lakes, rivers, and meandering streams. Montana locations, authors, and stars have had a place in the film industry almost since the first motion pictures were made. In the silent-film era, Billings cowpoke William S. Hart became a household name, and Butte’s Mary MacLane wrote the scandalous Men Who Made Love To Me, adapted to the silver screen in 1917. It is clear that the Smiths’ sense of aesthetics was shaped by their upbringing at Potomac, Montana, a forested haven crisscrossed with mountains. The brothers graduated from Missoula Hellgate High School. Their dad, David Smith, died in 1974, when the twins were 6. David Smith was a literature professor, lover of films, and aspiring screenwriter. Annick Smith led by example, showing her two sons that art required passion, inquisitiveness, and sacrifices. Annick forged a successful career as a writer and filmmaker, directing Heartland (1979), a stark, rugged saga of frontier life based on the diaries of a pioneer woman, which won the Golden Bear Award at the Berlin Film Festival. Heartland was shot in the area of Harlowtown, White Sulphur Springs, and Garneill, Montana. Location scenes included storms over the prairie and local cattle brandings. Not only has moviemaking allowed the siblings to creatively exorcise some of their difficult memories, but it has fostered the rebirth of their own cultural awareness. Indeed, the state’s stern, poised visage and durable residents are a far cry from the easy smiles of a Hollywood backlot. Bill Pullman, who plays a leading role in Walking Out, brings his own Big Sky connection to the film. Having exercised his craft in the 1980s peforming and directing with Shakespeare in the Park, a theatrical outreach of Montana State University, Pullman went on to co-chair MSU’s Theater department and plant roots in Montana that hold him to this day. The Smith twins, too, attended college, separately, and both ended up with Master of Fine Arts degrees in writing. They worked on The Slaughter Rule script for almost six years, including time at the Sundance Institute, Robert Redford’s incubator for promising films. The Slaughter Rule was accepted into the influential Sundance Film Festival, and Village Voice said it was “the most impressive feature by far in the dramatic competition” at the festival. In the winter of 2000, the Smiths co-directed the film in Montana. Winter in the Blood is based on the first novel by James Welch. Welch, who died of a heart attack at age 62 in 2003, was a product of the Hi-Line—born in Browning of a Blackfeet father and Gros Ventre mother, and raised on the Fort Belknap Reservation. Published in 1974, Winter in the Blood tells the narrative of a young Native American who violently grapples with his heritage and his life. Citing their respect for Welch’s novel, then-Governor Brian Schweitzer offered to make his plane available to fly in potential investors, and Native American tribes approved filming in previously off-limits spiritual places. Winter in the Blood was filmed in Havre and Chinook during the summer of 2011. In addition to writing and currently directing the feature film adaptation of the short story Walking Out, the brothers are adapting the Wallace Stegner novel Remember-ing Laughter for filmmaker Rodrigo Garcia. All the while, they remain as loyal and affixed to their creative impulses as they are to each other. That’s not to say spats and disagreements don’t arise, it’s just that they have played, worked and grown together as a team for so many years that filmmaking instinctively broadens their mutual evolution. “Generally speaking, when one of us sees something and wants to go after it, the other generally trusts that there is a reason for it—and it’s probably a good reason,” said Andrew. While the scale is greater than before, the brothers’ belief remains that Montana tales are too complicated for tidy, generic, or ordinary resolutions.